Following confirmation that a health worker in Madrid had become the first person outside of West Africa to contract Ebola, officials in Spain said they were taking measures to ensure that the virus wasn't passed beyond her. But in the eyes of many, efforts to stop the possible spread have gone too far. 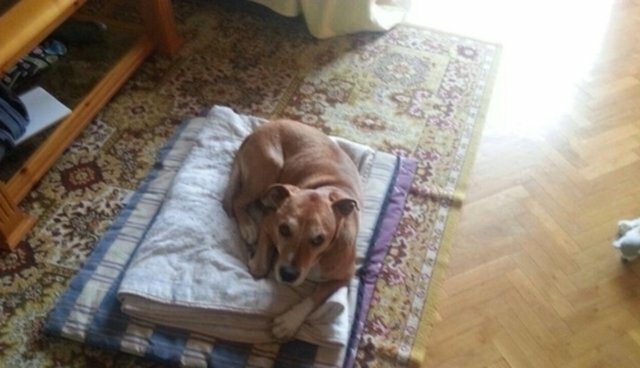 It's unclear if Ebola patient Teresa Romero's dog, Excalibur, was exposed to the virus - or that he could spread it if he was indeed infected - but Spanish health authorities on Wednesday reportedly have carried out their plan to destroy the pet as a precaution against having the disease spread further. According to newspaper El Mundo, a team entered Romero's home and collected Excalibur, who, sources say, has since been euthanized, though no official announcement has been made. After the order was given this week that the dog be killed, dozens of protesters collected in front of Romero's home urging that the pet be shown compassion. Likewise, more than 350,000 people around the world agreed, adding their names to an online petition calling for Excalibur to be spared. "If this woman were to die, the dog which has accompanied them for so many years would be an important emotional support for her husband. This is not ‘just' a dog, for this couple he is one of the family," reads the petition on Change.org. Romero's husband, Javier Limón, who's been placed under quarantine, also released a statement asking that his dog be spared. "If this worries them so much, I think an alternative solution could be found. Like, for instance, putting the dog into quarantine and observing him as is being done with me. Or am I going to be sacrificed as well, just in case?" he wrote. The recent outbreak of Ebola across West Africa has so far claimed the lives of nearly 4,000 people, with thousands more feared to be infected. Although there have been no documented cases of a person becoming infected by a dog, scientists say "dogs could be a potential source of human Ebola outbreaks and of virus spread during human outbreaks." Ebola has been shown to be transmissible to humans from other animals, however. The UN believes the latest outbreak was triggered after a bushmeat hunter in Africa ate or sold a bat that was infected with the virus.